25 Gram Bag(s) of Gold Ghost Pearls. 1600ºF Temp Threshold, and good in any Medium of Paint, Powder Coat, Leather Paint, Cosmetics. 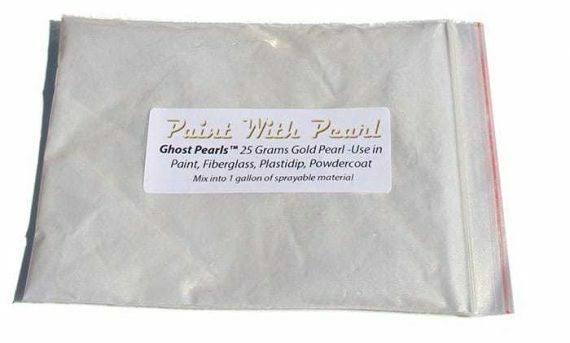 This 25 gram bag of Gold Ghost Pearls paint powder is a great special effects pigment for adding to clear in paint or powder-coating applications. Try them in epoxies, resins, glycerin and polishes as well. It mixes well with any clear paints or tinted candy paints. Candy Pearls have a temperature threshold of about 1600 degrees fahrenheit. It is a very fine powder and will spray well through airbrushes, powder guns, and HVLP paint guns. These are very light, so it stays well mixed in paint without settling too fast in your gun. 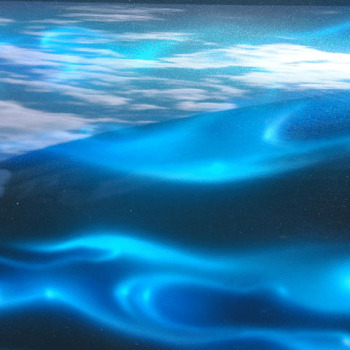 You can make great tinted clears for light to heavy effects (it’s your choice). One 25 gram bag Gold Ghost Pearls paint powder treats from 2 to 4 quarts of clear. Gold Ghost pearls paint powder has more sparkle than normal pearl, so it really stands out in the bright light! White base coat: Use any of the ghost pearls, but keep in mind that the red ghost pearl will give you a iridescent pink look in the sun. Blue, violet, orange, gold and silver are the most popular colors for white base coats. 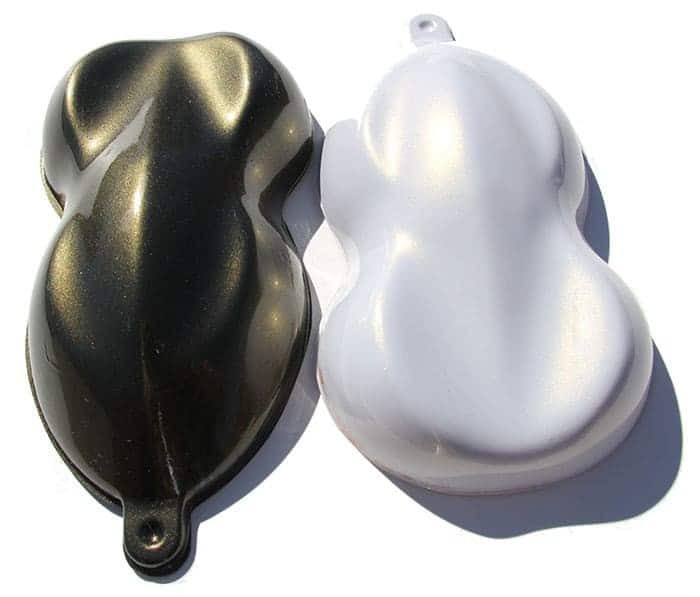 Black base coat: You also may use any of the ghost pearls, but keep in mind that using too much will make the project take on the color of the pearl and overwhelm the black. To get a cool midnight color change effect, keep the ratio of pearl down to about a teaspoon per quart in the clear base or binder. 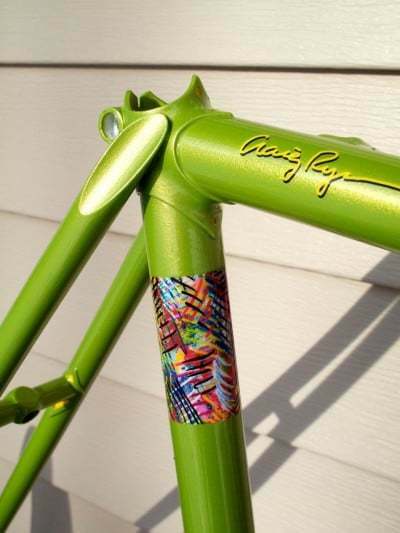 In powder coating, keep the ratio down to a tablespoon per pound and add onto that as needed. We highly recommend any of our Gold ghost pearl paint powders, including the shimmer gold or the satin gold. Also, Blue pearl red pearl, and violet pearls can make for great effects over the darker shades of red. For very light blues (like cornflower blue), we have seen excellent results using gold ghost pearl, but for a cool color shift on any shades of blue, a violet ghost pearl will give you a cool purple color shift in the sun. 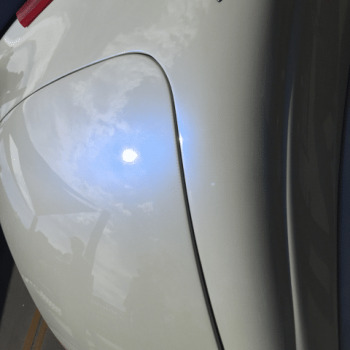 Silver ghost pearl paint can also give a nice subtle effect to the darker blues. Green can give an awesome pearl effect over most blue bases as well. We highly recommend that you try using green ghost pearl for the lemony yellows, and gold ghost pearl for the darker racing yellows. Gold Pearl Paint has been seen on newer Lamborghini’s over yellow as well. Gold ghost pearl looks great on green base coats. We have also seen good results with orange and red ghost pearls. Believe it or not, you will find that silver ghost pearl looks awesome over pink, as does the red ghost pearl. Try our Red Ghost Pearl, Green Ghost Pearl, or Silver Ghost pearl. If you are still confused over which products would look good over your existing paint, or want to discuss your options, contact us. We at Paint With Pearl appreciate all of our customers! Especially those who take the time to send us pictures and feedback on all of our products. 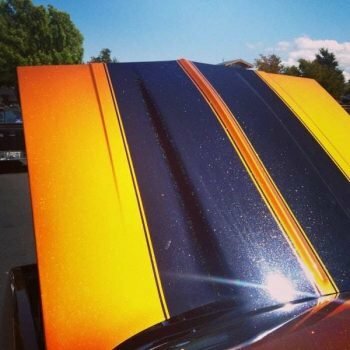 Our Candy Pearls, Metal Flakes, True Chameleon pigments, Thermochromics, Glow In The Darks and all other paint pigments are truly custom paints and can be used in almost any application. There are so many options with our products! Photos, Videos and testimonials are a great way to show off the capabilities of our additives. If you find the opportunity, send us some great pics and a small testimonial about what you did with our products. We will send you a gift card for the website. We love to show off the work that our customers are doing. Contact us and send us your work! Of all of our Ghost Pearls, our Gold Ghost Pearls Paint Powder is one of the flashiest powders you can add over many colors for brilliant effects.